Dubai, UAE, July 09, 2018: The very definition of vintage is “something from the past of high quality, especially something representing the best of its kind”. The Lepine is exactly that. Reminiscent of watchmaking origins, it takes a contemporary approach to revive such traditions. The Lepine combines the best of the past and present. Traditional style pocket watches are popular with older generations who are looking for an accessory, which is both distinguished and practical. 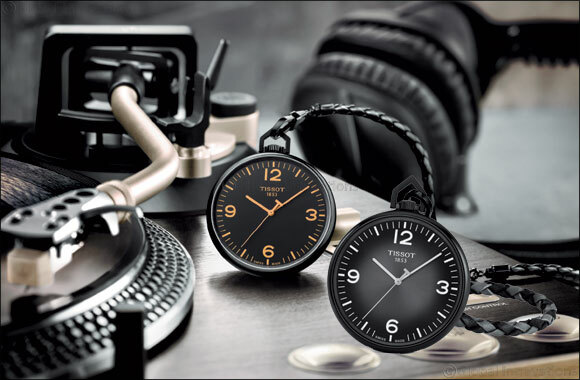 Now, the young and the trendy can get involved thanks to the super stylish Tissot Lepine, which breathes new life into pocket watch design. Perfectly adapting to the needs and fashions of the next generation, it combines heritage with modernity to spectacular effect. A modern makeover Every part of the Tissot Lepine has been created with the youth of today in mind. The perfect size to slip effortlessly into your jeans pocket, it is compact enough to be worn as a chic accessory. A contemporary design means it won’t look out of place with today’s trends, and a relatively fine case crafted from aluminium allows Tissot to offer the piece in a plethora of hues. Wearers will enjoy choosing the colour that appeals to them most, and will no doubt also be drawn to the braided leather chain, which brings a dynamic finish to the Tissot Lepine, perfectly uniting elegance with urbanity.